From my perspective, wordless picture books are an under-appreciated genre. “Readable” in any language (or multiple languages), they help children to develop comprehension skills and they can be used to prompt discussion and encourage language development. Last week, I had the pleasure to read two wordless picture books by Molly Idle. 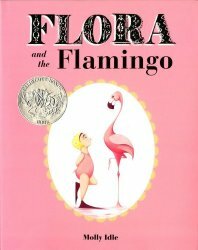 Floral and the Flamingo was published in 2013. Flora and the Peacocks was published this year. Flora and the Penguin was published in between. Floral and the Flamingo begins when a young girl approaches a statuesque flamingo and takes her cues from the bird. Soon it appears that the flamingo is challenging the girl to match her posture and form. Floral is up to the task. She stands on one leg, she arches her back, she stretches and poses. 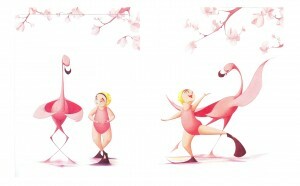 Before too long, the flamingo and Flora are dancing together and loving every moment of the experience. A truly lovely picture book that uses flaps beautifully, this will have special appeal for fans of ballet. Delightful illustrations are wonderfully expressive and will create an opportunity to talk about Flora’s emotions as she does her best to match the graceful flamingo’s movements. The third book in Ms. Idle’s series, Flora and the Peacocks adds another dimension to her storytelling. 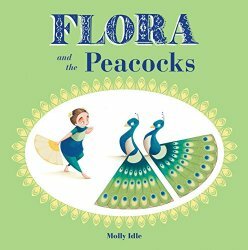 In this wordless picture book, Flora introduces herself to two peacocks. One of the peacocks appears quite happy to have a new friend but the other is not keen at all. The trio struggles to find a way to find harmony and to be friends. Dramatic illustrations highlight gorgeous blue, green and gold peacock feathers and the especially the facial expressions of the three characters. Young readers will want to talk about why it was difficult for Flora to join the two peacocks and how their behavior changed over the course of the story. An excellent choice for classroom and home use.